The Stonebridge Lane chalk stream habitat restoration project was an opportunity to improve a stretch of chalk stream on the eastern outskirts of the market town of Marlborough. Offer opportunities to learn about chalk streams and the associated wildlife through open days, school visits and fly fishing days. There was no public access to the bank, but the public footbridge at the western edge of the site provided a good view of the reach. It was easily accessible from the town and the existing footpath/ footbridge was frequently used. The land was overgrown and impenetrable in summer. 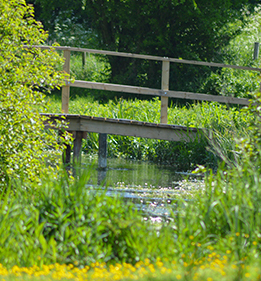 In May 2011 the site was opened as a ‘wild river reserve’ – a new space where people can access the river and witness the amazing diversity of wildlife in and around this chalkstream. In Spring 2012 the boardwalk was extended to enable disabled access for the full length of the reserve. This project was highly commended in the Community Engagement and Access category of the 2012 Biffa Awards.